Southern Illinois University Press, 2017. In the lobby of the Ford’s Theatre Center for Education and Leadership in Washington, D.C. stands a three-and-a-half-story tower of Lincoln books. It contains fewer than half of the fifteen thousand books—and counting—published about the sixteenth president. It is meant to be a statement of Old Abe’s enduring importance to the Republic. Instead it resembles a game of Giant Jenga that some drunk librarians were too afraid to start. It is no doubt a relief to visitors that the books cannot be checked out. Readers of the University Bookman—somewhere between exasperation and resignation—probably wonder whether we really need another book on Lincoln. The answer is—in the tradition of lawyers everywhere—it depends. Richard Carwardine, professor emeritus at Oxford University and author of the prize-winning Lincoln: A Life of Purpose and Power, fills a legitimate gap in Lincoln studies. How can this be, you ask? Well, it is a slim gap and Lincoln’s Sense of Humor a slim book. Little systematic effort at analyzing Abraham Lincoln’s humor exists. 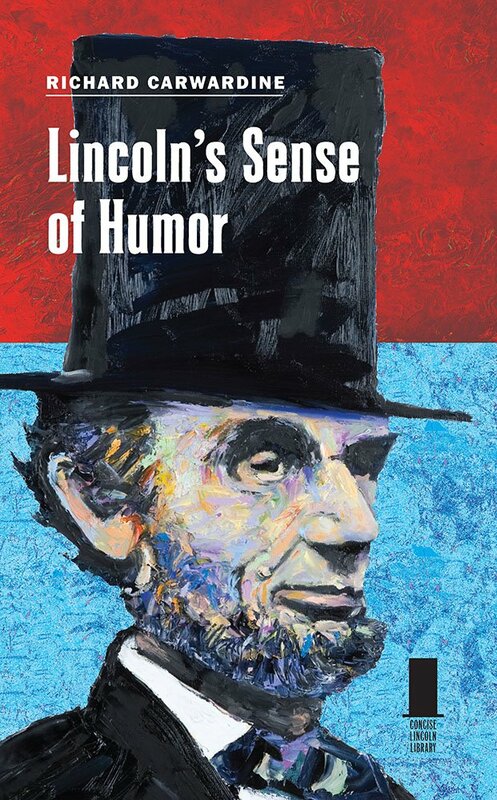 There are numerous collections of jokes and stories—many of which Lincoln did not tell, or at least the evidence is suspect that he did—and attempts by biographers (including Carwardine) to convey some sense of Lincoln’s humor as it informed his life and career. But one would have to go back to Benjamin P. Thomas’s collection “Lincoln’s Humor” and Other Essays, edited by Michael Burlingame, to find anything remotely serious about Lincoln’s funny side. Carwardine’s book is simply and logically organized. It is also well written. It might even be considered a miracle of concision were it not for the twenty-four other volumes in Southern Illinois University Press’s marvelous Concise Lincoln Library. The book’s chief virtue is Carwardine’s ability to give us a palpable sense of a man who lived over a century and a half ago, and not merely by sharing in the laughter but in better understanding how he used it; as sword and shield, refuge and release, charity and instruction. As many shades as Lincoln’s humor had, and as many uses, its reception was anything but monolithic. Carwardine, in a helpful bit of historiographical clarification, demonstrates that the “positive and benign” characterization of Lincoln as a folksy frontier storyteller only emerged after his death. During the dark days of war, he was criticized and derided for laughing in the midst of death and devastation. In the Confederacy, this was no surprise. That he was criticized so vehemently in the North—publicly and privately—will surprise many readers who last encountered Lincoln in a textbook or in the Bardo. But even seasoned students of Civil War politics and history will likely be impressed by the range of attacks on the president. And, lest we think our own age has a monopoly on partisan nastiness, it is a healthy reminder what the Republic—even when ravaged by war—can bear from the worst angels of our nature. Sorting through the complexities of Lincoln’s humor is where Carwardine excels. One of the ways he does this is by showing how Lincoln’s sense of humor evolved over time and relative to the case before a jury, the opportunity for political advancement, or the gravity of the nation’s existential crisis. This approach rectifies a dichotomy often seen in popular renderings of Lincoln in which he is portrayed as either a “smutty joker” or a melancholic depressive awaiting the next revelation as the new Moses, or both. The man was somewhere in between—a fact Carwardine is not the first to suggest but one given profound and nuanced treatment in his book. Lincoln’s humor and melancholy, then, ought to be seen in relationship, not opposition. Russell Kirk, whose regard for Lincoln rankled more than a few conservatives, observed, “Here was a man of sorrows. It has always been true that melancholy men are the wittiest; and Lincoln’s off-colour yarns, told behind a log barn or in some dingy Springfield office, were part and parcel of his consciousness that this is a world of vanities.” Lincoln’s humor and melancholy, then, ought to be seen in relationship, not opposition.Carwardine is adept at drawing out such connections in so limited a study. But for a rich exploration from another vantage point, one should turn to Joshua Wolf Shenk’s excellent Lincoln’s Melancholy: How Depression Challenged a President and Fueled His Greatness (2005). When read together, the reader gets a fuller sense of the man and has a deeper appreciation for the dominant dimensions of his personality. It is fascinating to consider these two dimensions in relation to each other and those around him. Shenk says of Lincoln’s melancholy character—and by extension, his capacious humor—that it gave him “access to the deep channels of the soul—the waters of sadness, the bedrock of constancy, the gold of mirth. Because he felt deeper and thought harder than others, Lincoln could be expected to alternate among states more quickly, returning, more often than not, to sadness, disquiet, perturbation, and gloom.” Thus did William Herndon say of his law partner, “Gloom and sadness were his predominant state.” But a former law clerk also observed how easy it was to change Lincoln’s mood with a joke or a story. Neither Lincoln’s sense of humor nor his melancholy can be understood in isolation, and neither author attempts to do so despite their respective book titles. Much is gained by considering them individually, relative to the other, and in such a way as to offer deeper insights into Lincoln’s personality. Lincoln’s humor and melancholy drew from the same well, each aiding him in different ways at different times. Both contributed to his greatness. And to at least two of those fifteen thousand books. Timothy D. Lusch is an attorney and writer. He has appeared recently in the Toronto Star, Michigan History, Chronicles, Saint Austin Review, New Oxford Review, and Catholic World Report.